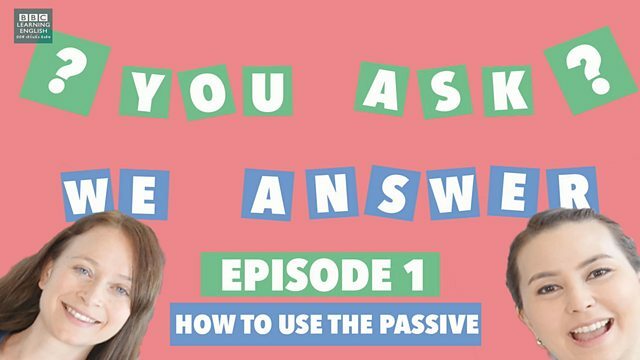 Today's question from Thailand is about when to use the active and the passive forms - join Sian and Clare as they answer this question and share with you 4 occasions when you should use the passive structure. What is the difference in meaning between these two sentences? a) Sian is filming Clare. b) Clare is being filmed. Sian is filming Clare (the focus is on the person doing the action - Sian). Clare is being filmed (the focus is on Clare and the person doing the action is not important). How do we form the passive? ในการเปลี่ยน tense ให้เปลี่ยน 'be verb'. My lunch has been eaten. The fridge is checked regularly. มาฝึกเปลี่ยนรูปประโยค active เหล่านี้ ให้เป็นประโยค passive ดูนะคะ! Change these active sentences into passive sentences! It is obvious that the police do this action, so we don't need to mention them. The police arrested a young man for dangerous driving last night. We don't know who did the action so it's good to use the passive here - check the tense though! Somebody has broken my window! Ok, so this is a formal notice so it's good to use the passive here. Also it's obvious that the cleaner is doing the action. The cleaner is cleaning the toilets - please do not enter.